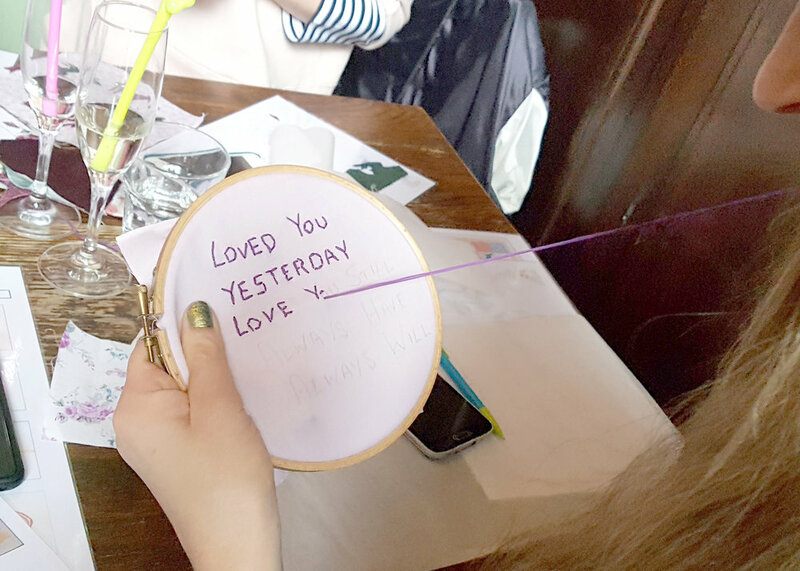 Gather together for a Crafty Hen patchwork party. Capture shared memories in a bespoke wedding quilt with materials handpicked to match your colour scheme. Create a treasured wedding quilt with all the hens involved & working together to design bespoke patchwork squares in your chosen colour scheme. A beautiful memento and keepsake of any hen party with all the hens contributing to personalised quilt or set of cushions that can be treasured forever by the Bride-To-Be. We will bring along a wonderful selection of hand picked fabrics, tailored exactly to you colour scheme, wedding colours, or to match the happy couple's home. We will show you appliqué techniques and sewing skills, and bring a wonderful co-ordinating haberdashery (including ribbons, lace, bows, beads, sequins and more) for you to use to decorate and embellish your patchwork squares. Each square can all be themed around the Bride or your shared experiences with her, and you can make your squares as detailed or simple as you like - and make as many as you like! We'll work with you before the party to tailor the session to your group as much as possible so the end result is exactly to your Bride-To-Be's tastes. 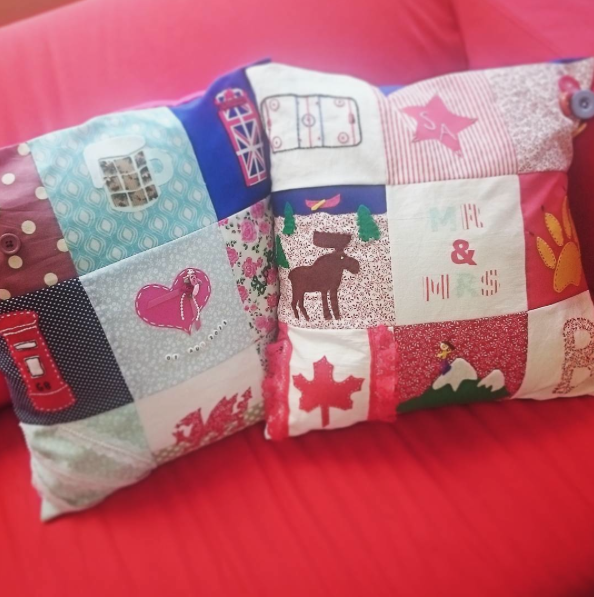 Your customised squares can then be assembled into a bespoke patchwork quilt or set of cushions after the session. This workshop is also available as a vintage option with a selection of quality vintage fabrics, genuine lace and buttons. Additional Fees: We can assemble the quilt for an additional £75, or cushions for £20 each and deliver to the Bride in time for the wedding. Or we can provide the extra materials for you to assemble it at home with no extra charge. Group Size: Minimum charge for less than 10. No maximum. Suited To: Anyone! For those of you who haven't done any basic hand sewing before we'll show you how. For more experienced sewers, we'll show you some new and interesting skills to extend your knowledge. All materials are handpicked & curated to match the exact wedding theme or colour scheme. Vintage option available with authentic vintage fabrics and lace. Perfect for any vintage loving bride. Option to make cushions or a quilt, both a keepsake to treasure. Planning a Baby Shower? We also offer a baby quilt making workshop too. Or we can tailor the session to any other occasion you have coming up! We all had a fantastic time making patchwork cushions & I think surprised even ourselves with our talent & flair!! Big thanks to Julie for her help & patience!! It may have sounded a bit daunting to some of us at the start of the session, but we soon found our feet & really enjoyed getting crafty. I just want to say what a fantastic time we had on Saturday doing the patchwork quilt, everyone thoroughly enjoyed themselves and couldn’t stop talking about it. We all had so much fun creating the patchwork squares and putting our own touch and designs together to make the quilt a memory for Amy to keep which she is so excited to have once its all sewn together. I will defiantly be recommending you to friends and family and can’t thank you enough for all your organisation that has gone into this. I can’t thank Nic and Rebecca enough on how helpful and professional they were on Saturday they were great!